Have you ever had a conflict and wondered afterwards if you could have handled it better? Whether it’s resolving a conflict or simply dealing with it in a way that doesn’t cause so much stress and upset, most people will feel challenged. Even when we know, in theory, what we should say or do, in the ‘heat of the moment’ it doesn’t quite work that way. Conflict Management Coaching is a structured process that helps people on a one-to-one basis, to develop or enhance their skills, knowledge and competencies, to engage in and manage conflict at work or at home more effectively. 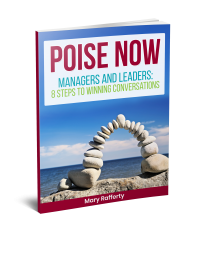 It is a process that can give you instant and concrete ways to move forward in many types of situations – from a difficult conversation with someone at work, being more successful in negotiating your proposals to performance management meetings. How does conflict management coaching work? It starts with getting clear on what your main goal is. At the start of a session, the Coach will help you focus on specifically what it is you want to get out of the session. You might not be fully clear at the outset what your eventual aim is but the Coach will help you develop some clarity around this and use it to keep you on track during the session. Some people might have one particular person or situation that they need to find a way of dealing with. For other people it might be a more general skill such as a tendency to fly off the handle too easily or on the other hand, a tendency to avoid raising difficult issues that do need to be addressed. Once you have begun to get some clarity and new perspectives and insights you are then ready to look at exploring options for taking the next step. The coach helps you first of all to identify what action might fit best for you and then helps you to develop in a very practical way, how you can go about implementing this. So it might be that you decide to raise an issue with someone. You will also have the opportunity to go through how you would want to phrase it, your tone of voice etc and get feedback from the coach on how it might impact on the other person. You will also explore what might be some of the barriers to moving forward and what you might do to overcome these. Depending on the situation, it may only take one or two sessions, for example if it is one issue and you just need some insights in how best to manage it. Many people find it useful to work in a little more depth on a couple of skill areas for example a difficulty in saying ‘no’ to people or an unhelpful conflict managment behaviour you might have. This would take longer – perhaps 2 or 3 sessions per month for a period of 2 to 3 months. Like most things in life, If you want to make real changes. they will take a bit of working on so you will need to be committed to the process.